The Southeastern Triqui are an indigenous group who have migrated from the mountainous western part of the Mexican state of Oaxaca and who maintain their pre-Columbian language and culture. Their primary language is Chicahuaxtla Triqui, but some do speak Spanish and children in the public school system in the USA are frequently bi or tri lingual. The Triqui peoples are known for their distinctive woven handbags and baskets. Like many other Southern Mexicans, many Triqui men travel to the United States as migrant workers, and remittances sent back to Oaxaca confer economic benefits to both migrant Triqui and their families in Oaxaca. The primary religion practiced by the Southeastern Triqui is a form of Cultural Catholicism layered over their traditional religion, and is rooted in the reverence of santos, their ancestors, and spirits in nature. Their religion is expressed through traditional fiestas, rites, and customs. Pray for Southeastern Triqui believers to boldly proclaim the gospel to their people. 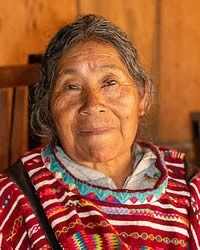 Pray that the barriers of traditional Triqui religion would be broken down. Pray for more workers for the harvest, both for the Southeastern Triqui in the United States, as well as those in Mexico.